KAB has announced that the theme for America Recycles Day 2018 is “#BeRecycled.” The intent of #BeRecycled is to encourage a commitment to the “Reduce. Reuse. Recycle.” mantra in every aspect of your life – at home, at work/school, and on-the-go. And it doesn’t have to stop there. When you purchase items, try to look for those made with recycled content – this supports the circular economy! If you have already registered your event, check out our ARD toolkit, which is full of great activity ideas and resources for your 2018 events and be sure to post ARD web-banners on your website. Reading and Recycling are important habits to form. The Georgia Recycling Coalition is excited to encourage both reading and recycling through the Read for Recycling program. This program is part of the state America Recycles Day (ARD) celebration. 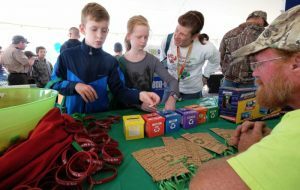 ARD is the only nationally–‐recognized day dedicated to promoting and celebrating recycling in the U.S. Annually, ARD is held on November 15th. Visit www.americarecyclesday.org for complete ARD information. Read a minimum of five waste reduction/recycling books; record them, and journal what you learned about waste reduction/recycling from the book in your Reading Journal (back page). Once complete mail your Reading Journal to the Georgia Recycling Coalition, Read for Recycling Program, P.O. Box 550667, Atlanta, Georgia 30355. AWARD: Four participating students from K ‐ 12 will be randomly drawn to win one of four (4) $50 gift cards to Barnes and Noble. Note to Teachers: The teacher with the most student participation will receive a class set of waste reduction/recycling books for his/her classroom.